The Garden State has had their share of big time guards through the years. Some have gone on to college and even NBA fame. Now the Garden State has a diamond in the rough, his name is Khalief Crawford from Linden, NJ. 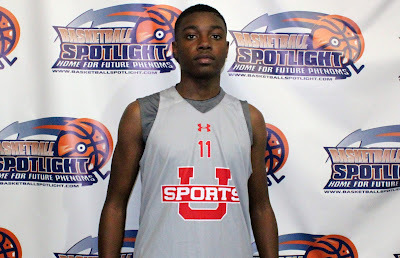 Crawford is a point guard for Team IZOD and we believe has potential to be a special guard down the road. Crawford’s coach Luis Delgado also feels he has a serious guard in Khalief. “Khalief is very aggressive on offense and setting up teammates. He uses his dribble to get into the lane and he’s a good finisher. He’s one of a few players in his class that can create for himself” said Delgado. Crawford’s coach did praise his guard but also knows he needs to work on a few things to make his game complete. “He needs to work his jump shot and getting it off quicker. He’s a good on the ball defender but needs to concentrate playing good defense off the ball” he finished. Basketball Spotlight will get a firsthand look at the Garden State best kept secret at the Clash For The Cup.